Vivo V15 Pro Design & Price Leaked: Features, USPs, Launch & More! Vivo V15 Pro Full Design & Price Leaked: Key Features, USPs, Launch & More! Vivo has been working on its V11 Pro successor for quite some time. 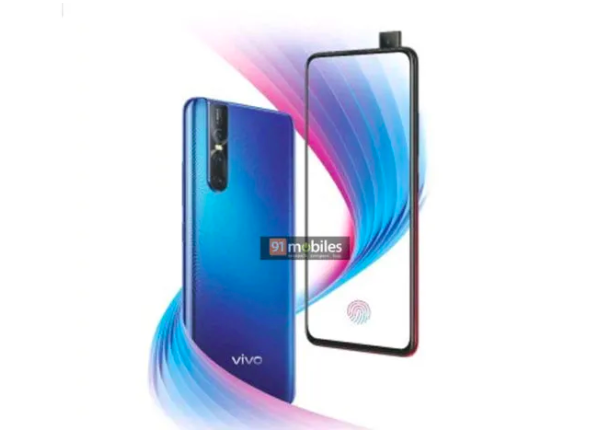 The company launched its Vivo V11 Pro in the country back in September last year, and now within five months, Vivo will launch its successor, Vivo V15 Pro in India. Set for a launch on February 20, the pre-orders will begin on February 15. In a recent poster leak, the whole design of the upcoming device has been shared online. We already know that Vivo V15 Pro will come with a in-display fingerprint sensor and pop-up selfie camera, the latest is the rear triple camera setup. The smartphone is going to take a lot from Vivo NEX, the company’s first try at a true full-screen display smartphone. 2 Vivo V15 Pro: Display, Features, Specs & More! The leaked images of the Vivo V15 Pro how a full-screen design with a bezel-less display, pop-up selfie camera, and triple rear-facing camera setup. The smartphone is expected to feature some latest technologies priced at an entry premium category. There will be no notch or bezel on the sides. But it will have a thin border at the bottom. The image shows us the blue variant of Vivo V15 Pro. The smartphone is going to be have an aesthetic design language comprising of a glass-and-metal sandwich design. At the back the smartphone sports a wavy pattern design. Vivo V15 Pro: Display, Features, Specs & More! The Vivo V15 Pro will come with a bezel-less screen and 32MP pop-up selfie camera hidden in the upper frame. Vivo V15 Pro is expected to feature a 6.4-inch AMOLED screen display with a thin chin below. It will sport an in-display fingerprint sensor and a piezoelectric speaker to replace the conventional earpiece for sound transmission, similar to Vivo NEX. At the back, Vivo V15 Pro will come with a triple-camera setup alongside a dual-LED flash. Under the hood, the midrange Vivo smartphone will run on Snapdragon 675 processor, dual-SIMs, and a 3,400mAh battery. V15 Pro also retains the 3.5mm headphone jack on top with a USB Type-C port at the bottom. The smartphone will also come with some sort of fast charging technology. The Vivo V15 Pro India pre-orders will start on February 15. Most probably the smartphone will be available via Amazon India and the Vivo India online store. You can pre-book the smartphone directly on any the two sites. The Vivo V15 Pro India launch has been confirmed on February 20. Vivo has reportedly partnered with Bajaj Finserv, HDFC Bank, Reliance Jio and HDB Financial to offer no cost EMI and other launch offers on upcoming Vivo V15 Pro smartphone. The exact offers will be available once the pre-booking starts. The upcoming Vivo V15 Pro is going to be a midrange smartphone, to be available at under 30,000 rupees in India. The pre-booking price is yet to be announced as well. The exact pricing of Vivo 15 Pro is not clear, but as per some sources, it’s going to be a sub-Rs 25,000 offering. Also, Vivo has dropped the V11 Pro selling price from Rs 25,990 to Rs 23,990 recently. Vivo V11 Pro will continue to sell in the Indian market, and the new Vivo V15 Pro will join the lineup. Looking at the premium features and latest technologies, the smartphone will not cost anything less than 30,000 rupees in the country. Is Your Smartphone Getting Latest Android 9? Check Out Full List Here!